Every year we deliver a free, week-long, Learning Festival for local schools and families. Our staff and volunteers work hard to put on a full and exciting programme of workshops and activities. 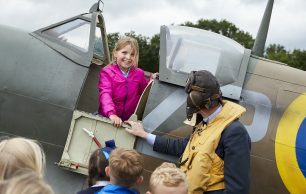 During the event we offer, among other things, interactive guided tours of Kenley airfield, artefact handling workshops, propaganda poster making workshops, performances by nationally renowned re-enactors, and the chance to go in both a replica spitfire and our old air man's shelter. This year we were joined by over 850 children, from 8 different local schools, and helped by 27 volunteers, to make the event a huge success.